This portrait of the Solar Campero family depicts two generations of elite Mexicans from Oaxaca, a provincial center in New Spain. Through a family tree design, the parents appear to sprout flowering vines, which in turn, support four children. The painting, which measures 207 x 203 cm (just under 7 feet by 7 feet), was first painted in 1806, but as indicated in the inscription, the image was amended in 1808 to include another child. The colors of the scene—the pale blue background, the pink-toned skin and pale reds—all link the image to the Neoclassical style, which was favored in Spanish America at this time. At the bottom right, is the family's progenitor and patriarch, don Manuel de Solar Campero. His title and costume “Captain of Granaderos” signals that he was part of a special military unit. Across from him stands his wife, doña Maria Josefa Magro y Galardi. While her dress may seem reserved, she wears gold jewelry and holds an imported fan. These were both standard elements for women’s portraits in Spanish America in the 18th and early 19th centuries. In addition to giving the date of the painting (28th of January 1806), the text at bottom gives the names of the family and their ages: doña María de la Concepción Josefa, who is 5 years, 8 months, doña María de la Soledad Manuela, 2 years, 7 months and doña María Concepción Joachima, 13 months. Each Solar child in the metaphorical family tree above holds different objects. Doña María de la Soledad has a flower in one hand, a small parrot in the other. All are dressed in fine dresses, shoes and jewelry. 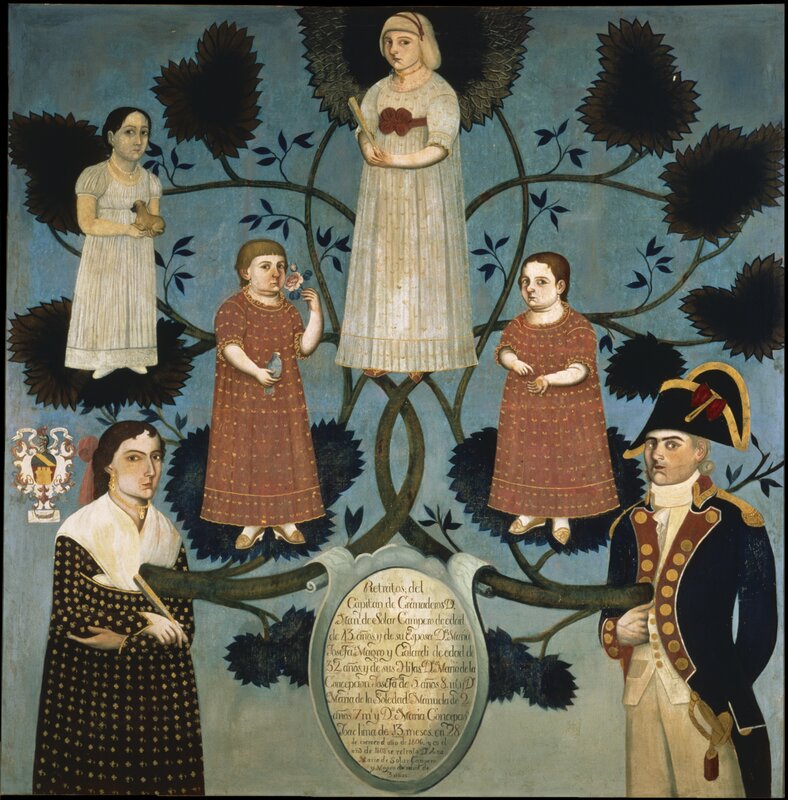 Doña Ana Maria, in the upper left, was the last child to be added when the painter revised the image in 1808. While she fits well into the family tree, her placement off axis interrupts the strong triangular shape of the original composition. Don Manuel Solar Campero was a leading merchant in Oaxaca, a provincial city in New Spain, whose trade networks reached as far as Guatemala. The family remained prominent even after Independence. After seeing English and French models of relaxed and informal family groups, painters in Spanish America absorbed these new tropes. This painter, however, creates a unique synthesis of the relaxed family group with the much older template of a hierarchical genealogy, or family tree, perhaps responding to his patrons’ desire to be both conservative and fashionable. The flatness of the background, the slight stiffness of the figures, and the incomplete illusionism of the twisting vines, suggest the painter of this portrait was not trained by the Academy, but perhaps was a local Oaxaca artist. The painter worked with familiar materials, oil on canvas. The hanging medallion at the painting’s center reveals that the artist, whose name has not been recorded, first created the images of the husband and wife and their oldest three children in 1806. Two years later, this artist returned to his work to update the family portrait, adding the portrait of one more daughter in the upper right, just off the central axis. The image thus represents a work of art created over several years, and revised as the family changed over time. This image probably was given pride of place in the Solar family house, and may have been passed down to one of the members pictured here. Today in the collection of the Museo Soumaya in Mexico City. This image represents a work of art created over several years, revised as the family changed over time. The ongoing desire of the Solar Campero family to record their lineage shows the wide demand for portrait paintings among affluent members of society. It also suggests how strong the desire to record lineages and family connections through visual imagery. Benson, Elizabeth, et al. 2004. Retratos: 2,000 Years of Portrait Painting. New Haven: Yale University Press. Lazos de sangre: retrato mexicano de familia, siglos XVII y XIX. 2000. Mexico City: Museo de la Ciudad de México. El retrato novohispano en el siglo XVIII. 1999. Puebla: Museo Poblano de Arte Virreinal.